Studio City is one of my favorite little neighborhoods to spend the afternoon in, grab a bite to eat, wander into some shops, and find a yummy latte. I compiled a list of some of my favorites, and some that are on my "must try" list that I've heard amazing things about, and I wanted to share them with you! On Sunday's, there's a great little farmer's market, and the shops tend to be a little less crowded, leaving room to really enjoy and stay a while. Joan's on Third: SO much yummy...iced tea, amazing fresh bread and baguettes, tasty salads and sandwiches, and a beautiful display of gourmet pantry foods and specialty treats. I love buying extra baguettes to bring home for dinner if I stop in for lunch. Lala's Argentine Grill: Another yummy lunch spot. I LOVE their Melrose Salad: chopped grilled chicken with lettuce, tomato, onion, feta cheese & warm rice tossed in spicy honey mustard dressing. It is fresh and light, yet still so filling. A great combo of delicious flavors! 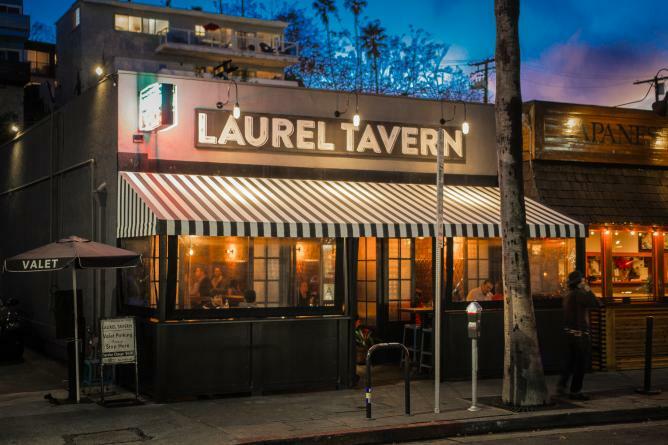 Laurel Tavern: A tucked away gastropub on Ventura Blvd. that has the most amazing burgers, but you can't miss their Hangar Steak & Fries...read Duck Fat fries. They're impossible to describe, because they're that tasty! This is a great spot to sneak out to on date night without the kids or with a group of girlfriends. It's community style seating and a really laid back vibe. Tender Greens: A delicious, farm-to-fork, casual dining spot that offers the yummiest meats, fresh salads and sides, and some of the best kombucha on tap. I love that you can pick and choose what you want the main part of your meal to be and customize your sides to round out the perfect plate. You can choose to create a plate with meat as your main portion, a salad, or a sandwich! I mean, YUM! Trader Joe's: Most people are familiar with TJ's and it may seem silly that we added it to our list, BUT this location is open until 10 PM! A great tip to keep in mind for when you have a late night sweet tooth or you just need to grab a couple things before your week begins, but it's already sort of late. Parking can be a little bit tricky, as at most locations, but their selection is HUGE! Definitely a go to! Alfred Coffee: With their mantra, "But First, Coffee", how could you not stop in for a latte made with Stumptown coffee beans? We've heard great things! Plus their design and branding is clean and beautiful! My kind of shop! Salt & Straw: Originally started in Oregon by two cousins, they specialize in handcrafted, small batch ice cream in the most delicious, unique flavors and we're so excited that they have now arrived in LA. Run, go, quick! They have multiple locations in the LA Area, but we love how cozy and quaint this one is. With flavors like Almond Brittle with Salted Ganache, Honey Lavender, and Avocado and Strawberry Sorbet, it's a good thing they let you split your scoop into two flavors! McConnell's: another AMAZING ice cream shop. They make their ice cream from scratch, in small batches, with Central Coast, grass-grazed milk & cream pasteurized from raw at their own creamery and the finest local, sustainable and organic, raw ingredients, sourced from partner farms, artisans and purveyors. We love the Churros Con Leche and the Sea Salt Cream & Cookies! Habit: one of my FAVE shoe stores! They have the most unique and special shoes that you won't see everywhere. Some of the most AMAZING brands are tucked away in this shop. I scored my favorite Eileen Fisher sandals (that I talked about in this blog post) in this spot! Entertaining Elephants: A children's boutique, owned by Ellen Massee, they carry the yummiest children's clothing in the most amazing fabrics. A great spot to find a gift or just wander for a minute. Add these spots into your weekend, I always enjoy spending some time in Studio City, and I know you will too!